Comments: John Randolph Phillips was born in Lynchburg on October 6, 1904, the son of Charles Robertson Phillips and Mary Ella Nichols. Randoph's family moved to an Albemarle farm several miles from Scottsville by 1910, and he received his first six years of education at a one room school near Novell's Store. In seventh grade, Randolph entered Scottsville School and began his Scottsville High School education two years later. Katherine Pitts, a girl he would later marry, joined his class during their junior year. In his senior year, Randolph won a $5 gold piece for his essay on 'Lee After Appomattox.' Randolph also served as the senior class treasurer, participated actively in the Scottsville High School Dramatic Club, and played shortstop on the boys' baseball team. After high school graduation, Randolph attended the University of Virginia where he earned a master's degree in English. After graduation, he moved to New York City to actively pursue his writing interests. By 1928, Randolph worked as an editor for Street and Smith magazine publishers. 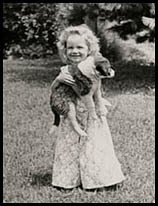 Katherine Elizabeth Pitts was born on January 19, 1907, at the Belle Haven home of her parents, John L. and Helen (Burgess) Pitts. Katherine attended Scottsville School where she was a good student with many interests. After her freshman year at Scottsville High School, Katherine was advanced to junior level classes and joined Randolph Phillips' class. In her senior year, Albemarle County awarded Katherine the McIntire cup for placing first in county scholarship. She also was a member of the girls' basketball team at Scottsville High School and the Dramatic Club. Katherine graduated from Scottsville High School with Randolph Phillips on May 30, 1923. She completed college preparatory classes at Stuart Hall in Staunton, VA, in 1924 and enrolled that fall at Randolph Macon Women's College. Katherine graduated from Randolph Macon in Spring 1928 with a degree in English. By summer's end, she'd completed a teacher's training program at the University of California and enrolled there for the fall semester to begin work on her master's degree. In December 1928, Katherine returned to the East Coast via a boat trip through the Panama Canal and landed in New York City. There she renewed her acquaintance with her high school classmate, Randolph Phillips. Katherine and Randolph married on April 6, 1929, in New York City's Church of the Ascension. Katherine's sister, Dorothy, was her maid of honor, and Phillip Conroy, Randolph's best friend in New York, was the couple's best man. 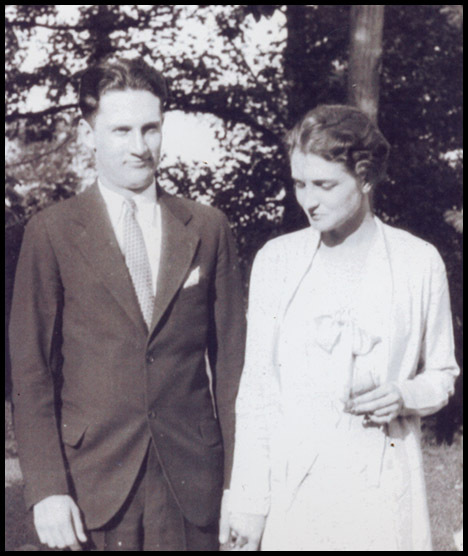 The happy couple returned to Scottsville in 1930 to live with Katherine's widowed mother, Helen, at Belle Haven and to help with the upkeep of this very large home. Randolph focused on his writing and began selling his short stories to magazines. On June 2, 1931, Randolph and Katherine became parents of a daughter named Kathleen Elizabeth Phillips, who was born in the same Belle Haven room as her mother. The photo at right shows Kathleen, aged about 3 years, on the front lawn at Belle Haven with her pet dog, Tody. Kathleen grew up and attended Scottsville School, too. 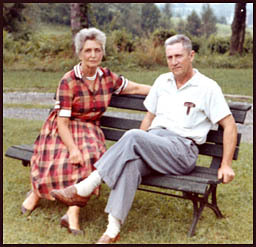 She married Sheridan James McNamara on August 9, 1952, and they are the parents of 5 children (Theresa Marie, Michael James, Elizabeth Anne, John Anthony, and Barbara Kay McNamara). About 1935, Katherine Phillips began teaching seventh grade at Scottsville School. She loved teaching and was a favorite teacher among local students. Katherine remained Scottsville's seventh grade teacher until her retirement in the 1970's. Randolph continued his free-lance writing, often going on location to research the site of his next story. His stories and articles appeared in such magazines as The Saturday Evening Post, Collier's, The American Magazine, Cosmopolitan, and Redbook. At least one of Randolph's stories, "A Night in the Swamp," was adapted for radio and TV drama in the early 1950's. He also loved to hunt, fish, and play bridge. 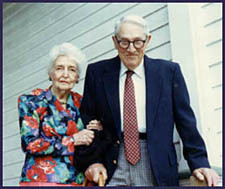 Shown at left is a photo of Katherine and Randolph Phillips taken at their Belle Haven home in 1990. Katherine Phillips died on January 5, 1992, in Charlottesville and is buried in the Pitts Family Section, Scottsville Baptist Church Cemetery. Randolph Phillips died on November 14, 1993, in Charlottesville and is buried beside his wife at the Scottsville Baptist Church Cemetery. These photos and Phillips family information are part of the Kathleen McNamara collection. Kathleen resides in Scottsville, VA, and is the daughter of John Randolph and Katherine (Pitts) Phillips.